3. 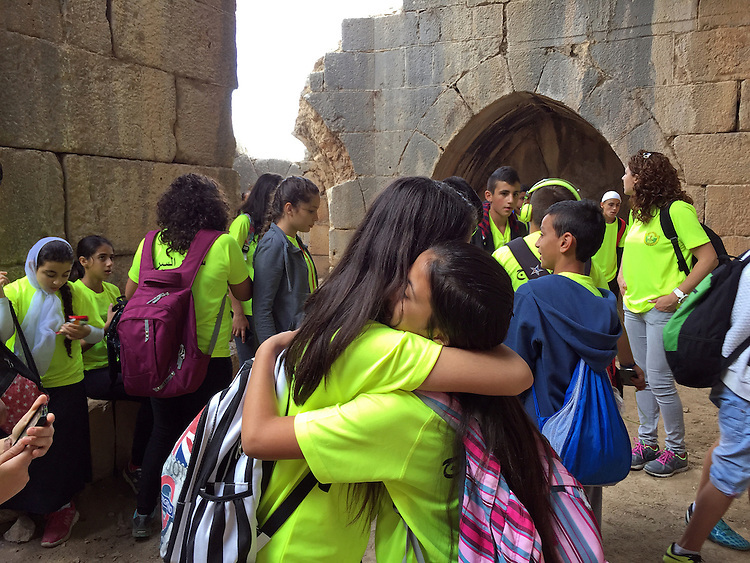 "Druze Children Embrace": Nimrod Fortress, Golan Heights. Expectations of Israel are often built on sensational news headlines, biblical or other religious texts, and competing historical/political narratives. These sources can foster deeply-held myths and misinformation. The fact is, Jews and Arabs aren't always enemies, we don't all hold the same views, and the Christian values of "love thy neighbor" are practiced by all faiths in the region. The Druze who embrace here are but one example. It was heartwarming to watch these youths hug each other with such unfettered affection. Like kids most places, they seemed happy and carefree. The Druze are an Arab minority in Israel. They self-identify as Unitarian rather than Muslim, and as a result have been persecuted by other Arabs for their beliefs. But in Israel, Jews and Druze get along well. Druze voluntarily serve in Israel's defense force, and as far back as the 12th century, the Jewish traveler Benjamin of Tudela is reputed to have said "they loved the Jews."